Legrand’s Plexo3 weatherproof cabinets are available in 11 sizes and have optimised dimensions from 2 to 4 x 18 modules, for distribution up to 125 A. These durable enclosures, with a fully reversible door and cabinet, ensure optimised cable runs and efficient cable organisation in commercial and industrial installations, as well as in public and high-rise buildings. Plexo3 modular cabinets, which are designed for quick and safe installation, have a removable faceplate for easy maintenance on individual rows. Other features for efficient installation include rails that can be individually removed and a removable chassis for wiring outside the cabinet. These units can be fitted with terminal blocks, which are easily repositioned at the top and bottom of the box. These UV treated cabinets have an IP65 rating for protection against dust and jets of water, ensuring suitability for installation in damp locations. Shock-resistant polystyrene is used in the manufacture of these units and an IK09 rating means enhanced protection against mechanical impact. A flush-mounted lockable door handle ensures improved shock protection and a double closing point has been designed for a reliable seal. The design of these cabinets provides plenty of space behind the rails (a 2-position rail, with depth adjustment), a space of 150 mm between the rails and 38 mm space at the side, allowing the cables to run easily. Specially designed accessories, including those for joining a multi-function sleeve, enable these cabinets to be equipped with one or more flush-mounted Plexo3 mechanisms. These include P17 industrial sockets and Osmoz industrial control and signalling units. Accessories have been designed for effortless tool-free fitting and removal. 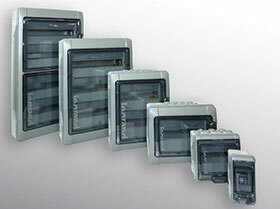 Different sizes of direct piercing end-caps and knockout cable entries can be mounted at the top and bottom of the cabinet. Cable glands are easily fitted according to exact requirements and hinges hold the cover for easy access to the cables. The joining kit allows cables to be run horizontally or vertically between the multifunction sleeve and the cabinet, or between two cabinets, with no compromise to the IP65 or IK09 protection ratings.